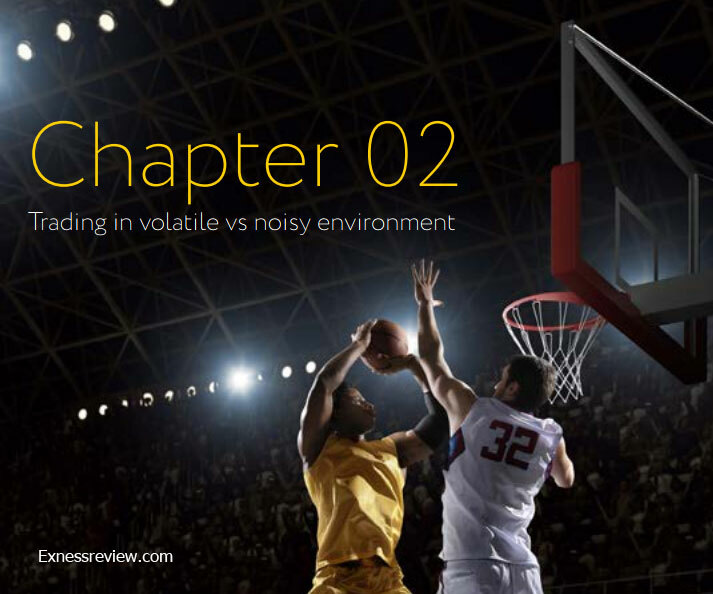 This chapter 2 will talk about "Forex trading in volatile vs noisy environment". Most of Exness' trader like to trade in volatile environment. But it's very risky. You can earn more and lost more. 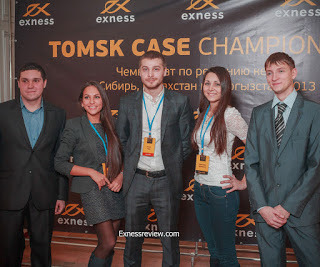 Some Exness' traders like stable environment because of special forex trading strategies. So, what should you do when you trade in volatile conditions? 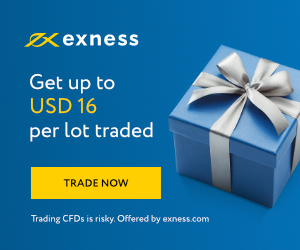 If you still know what forex account should you open in Exness. Read this article. Exness' traders can profit when there is a change in price and market direction is identified correctly. Sometimes, prices move back and forth. This may seem like an opportunity at first, but in the heat of the battle, it is difficult to identify the destination of a trend in such a case. It requires a lot of skills to have positive trading results from choppy, “flat” markets. A strong, volatile market may present more forex trading opportunities, but one must take caution in such cases and weigh the risks associated with volatility. Volatility can be measured in two simple ways—either by average volatility of each day, which is beneficial to short-term forex traders, or by the volatility of large trending moves. Let’s zoom into the second method of volatility measurement. 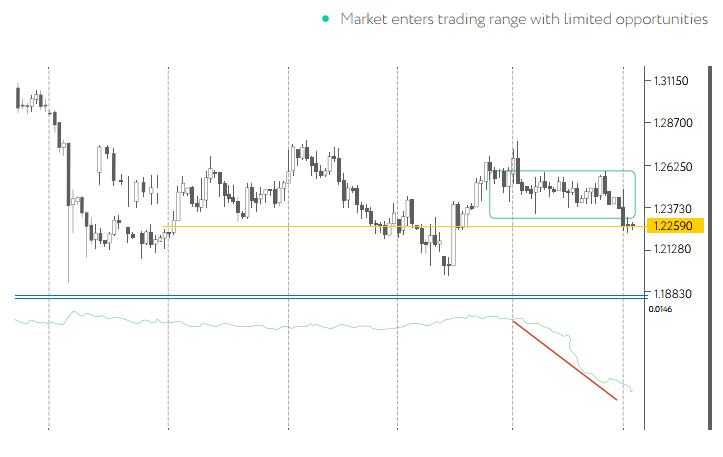 The first chart presents greater volatility than the second, with the price changing faster and with very limited correctional moves—an indication of active buyers and a prominent imbalance between supply and demand. Sometimes, Exness traders are afraid to go with the price in such cases, and more often than not, they go short (sell). Statistically and historically speaking, traders tend to achieve better results by going with the strong trend. * Ask yourself: Is the ATR value low or high? Is it increasing or decreasing? By trading currency pairs with high ATR, you are choosing to trade in a more volatile market. 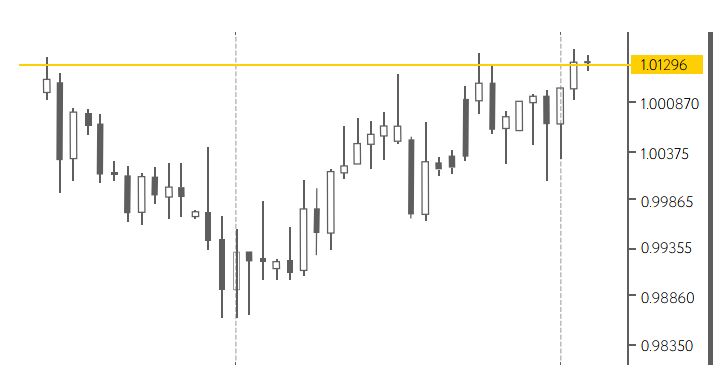 For example, take a look at the GBPUSD chart below. The ATR has been of high value. Now, it is decreasing and entering a narrow trading range. Of course, the market could break from this range soon, but opportunity is limited here since volatility is lower. In general, you may set any parameter of ATR as long as you are comfortable with it. For your reference, an ATR of 21 is popular among forex traders who wish to trade in volatile markets. Remember, the more volatile the market, the more trading opportunities it presents. However, do note that trading in volatile markets can also lead to greater losses. To trade in volatile forex markets, you first have to find it. Use the ATR indicator to measure the volatility of your preferred instruments every day. Create a list of the most volatile currency pairs—these will be candidates for day and short-term (one to three days) trading. 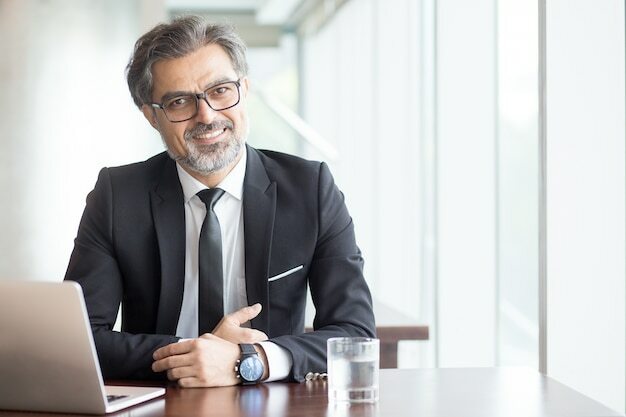 While volatile forex markets present more trading opportunities, they typically fit forex traders with considerable risk appetite given the fact that high volatility trading can lead to high losses.